MONDAY: Choice of: Breakfast sliders or cereal or Pop-tart with yogurt; fruit, choice of milk or juice. 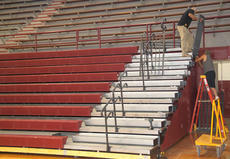 Bleacher installation at HCHS completed. The structural issues that delayed the completion of the Harrison County High School gymnasium project have been resolved. Air conditioning and heating units were installed initially, along with new lighting for the gym. However, when it was time to install the new bleachers, it was discovered that the walls the bleachers were to be attached to were unsound. Masons were brought in to stabilize those walls, which took about three weeks to complete. 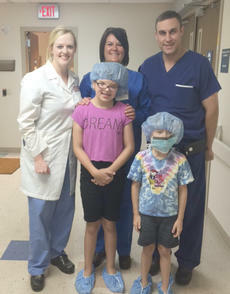 There was no shortage of heroes at the annual Kids’ Health Fair on Aug. 20. Children came from 10 counties in Kentucky (Montgomery, Clark, Bourbon, Scott, Fayette, Nicholas, Harrison, Jessamine, Bracken and Mason) and one county in Ohio to take pictures with Spiderman, Batman and Robin, Pokemon, Ninja Turtle, Elsa, as well as our hometown heroes - firemen, EMTs, physicians, nurses and other staff members. • Still in college at least half time. • In a rehabilitation training program. Eleven students from Harrison County have been named Senator Jeff Green Scholars by the Kentucky Higher Education Assistance Authority (KHEAA). To earn this honor, a student must have a 4.0 grade point average each year of high school and at least a 28 composite on the ACT. MONDAY: Choice of: Nutrigran Bar with yogurt or cereal or Pop-tart with yogurt; fruit, choice of milk or juice.